data input to your mobile apps. ABBYY Real-Time Recognition SDK enables developers to add ‘instant’ text capture functionality to mobile apps. Payment data on invoices, personal information on ID cards as well as codes printed on daily goods for consumer contests, text on street signs or warning plates can be immediately captured and used in the mobile app - the user only needs to focus the camera at the text. Why ABBYY Real-Time Recognition SDK? Extracting text directly from the smartphone’s preview screen is significantly faster and more convenient than taking a picture of the text followed by an OCR step or entering the text manually. Real-time text capture from documents such as invoices, waybills, sick notes or letters can be quickly implemented into existing corporate apps in banks, transport companies, insurance, and other organizations. As the text does not need to be photographed, saved in the memory storage, uploaded to cloud services or external servers, this modern way of information capture is suitable for organizations with the highest data security standards. We have combined ABBYY’s proven OCR technology with new intelligent algorithms that recognize text from live video streams. This SDK technology ensures superior text recognition accuracy within apps for both businesses and consumers. See instant text extraction in action. The ‘point and capture’ approach – text capture directly from the smartphone’s preview screen - offers a completely new user experience. By simply pointing the mobile device’s camera at ID cards, passports and other identification documents, customer data is transferred into company systems without the need to type them in. 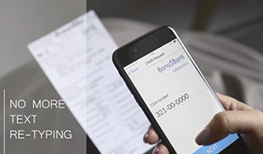 Information necessary for a money transfer can be inserted directly into the fields of a mobile banking app by focusing the smartphone’s camera on payment slips, invoices or other payment documents. Enterprise companies can increase customer satisfaction and loyalty by providing modern apps that allow clients to communicate easily and exchange data with their vendors. When pointing the smartphone’s camera at text, the technology is continuously recognizing the text from the ‘live’ video stream. This enables instant recognition of text on documents or objects without the need to take a picture. Ready to try? Need more info? Just fill in the form below and we will be back to you shortly.